Check out this cute idea. When we were in Maine last summer we stopped at several antique/junk shops. We found several old letters and numbers that I fell in love with and just had to have. 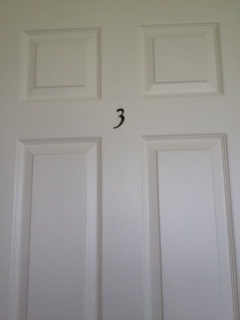 So we thought it would be fun to put them on all the doors. 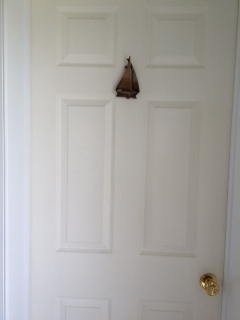 I thought it would be cute to add the sailboat door knocker on the powder room door. I dragged my boys with me today to drop some clothes off at Goodwill and of course I had to shop while I was there. 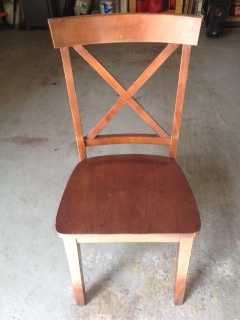 I found this chair for $5 that’s right $5. I knew that it would look good with my new desk that I found and showed you here. I used my hand sander to rough up this $5 find. 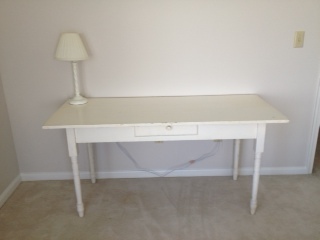 I primed it with Rust-Oleum primer and painters touch in flat white. I finished it off with Ace premium light gray gloss. I think it will look great with my new/old desk! 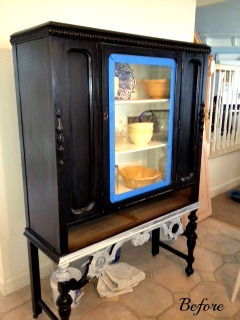 This is an old china cabinet that my husband had even before my time. 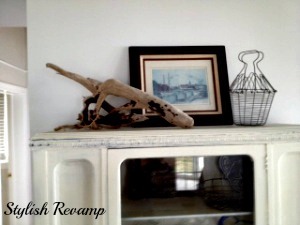 Anyway, years ago I painted it black and I liked it at the time but when we decided to take it to the Island Home I wanted everything to have a light and airy feeling. 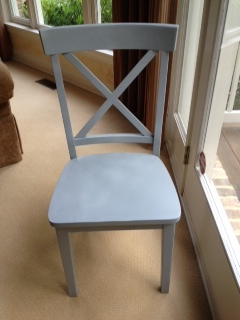 So I decided to try the Annie Sloan Chalk Paint that everyone is talking about. 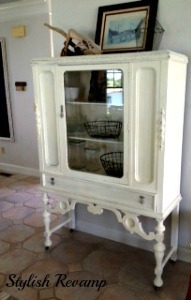 I used Old White and I think the cabinet looks so much better. 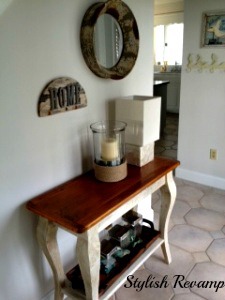 I still need more practice with the chalk paint. I am just used to spray paint. 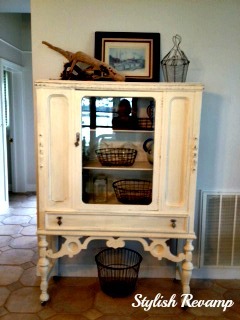 The pictures are not great but check out the drift wood on top of the cabinet. FREE! 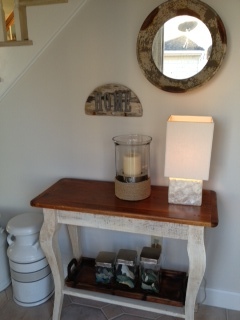 I am not completely done styling this part of the room but for now I am o.k. with it. 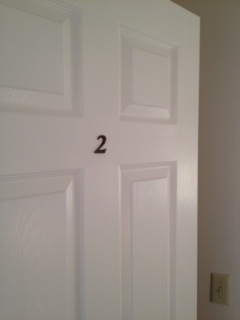 Finally, I can show you the entryway into our home. It is really small but I think it looks adorable. Notice the home sign that I showed you in an earlier post. 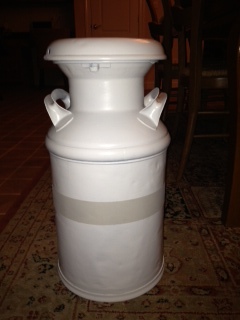 Also, you can see one of the milk jugs that I repainted. On the lower shelf of the hall table you can see the three canisters. They came from Goodwill. Love it! The sea glass inside the canisters…. free… except for the hard work rowing the kayaks out to our favorite place to get sea glass! I have to say it is one of my favorite things to do with the boys! 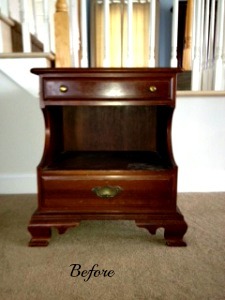 I am always excited about what hidden treasures we might find! Next up I think I will show you the kitchen! 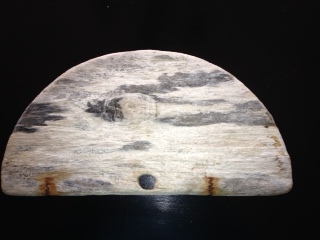 This is a piece of wood that washed up at high tide. I love the sun bleached grey colors. I think it is part of a bushel basket. I went to Michaels and found the letters and thought they would be perfect. 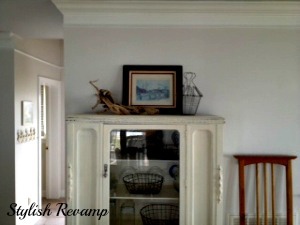 I spray painted them Gloss Classic Gray from Krylon which I also found at Michaels. I think this will look perfect hanging in the foyer next to my mirror. I will post more photos once all the painting and drywall repair work is done and I have had a chance to place everything back into each room. Here is the the home sign in my foyer at the Island Home. So for less than six dollars, I have a unique one of a kind sign for my home! 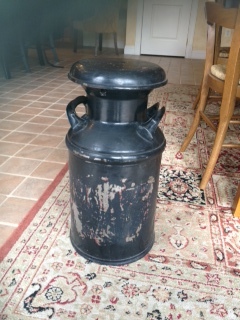 My Husband had a couple of milk cans in the garage that used to be his father’s. I decided to reuse them at the Island home but first they needed a revamp. I had to sand them down with my sanding block. 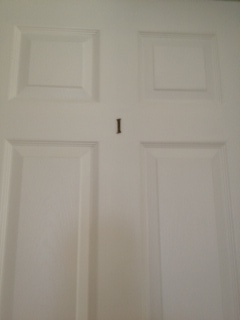 Then I used Rust-Oleum primer and painter’s touch in semi-gloss white. On the first milk can, I added black letters from Michaels. 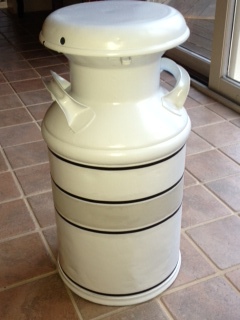 On the second milk can I used Krylon classic gray for the stripe. I might add a few more stripes but for the moment I am happy with what I have. 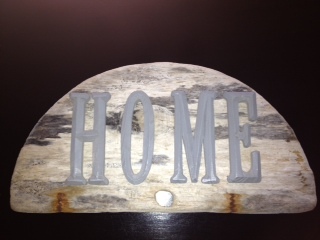 I like the gray stripe because it matches the gray lettering in my home sign. 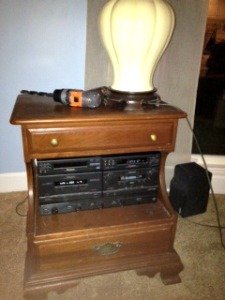 I think I will place all of my reused items in the foyer of the house. 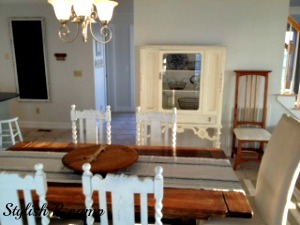 I will add more before and after pictures once I have everything back in the house and I can show you the complete transformation which should be really soon! Well, that lasted about a day before I had to make changes. 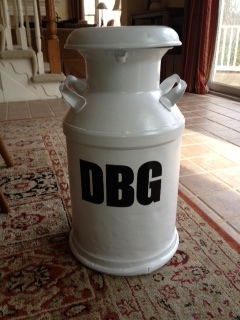 I added the black stripe which I think ties it into the black lettering on the other milk can. I think I am finished…for now! This is one of my favorite spots in the home. 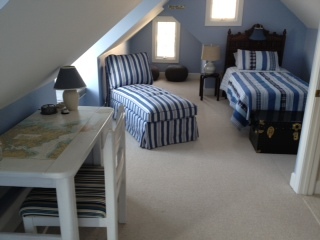 I need to search for some before photos because this room has been totally revamped. 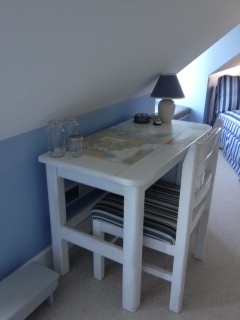 I am going to break it down for you: The walls are painted Blissful Blue by Sherwin Williams sw6527. 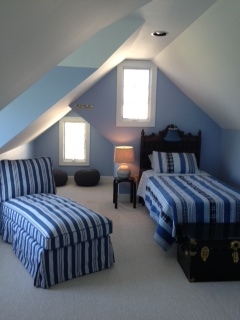 The ceiling are painted Eider White by Sherwin Williams sw7014. 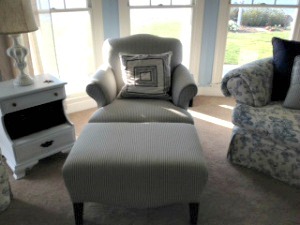 The chaise lounge was bought from IKEA …love, love, love it! The headboard we had. It was a gift from our Aunt. The bedding I bought at Bed, Bath and Beyond. 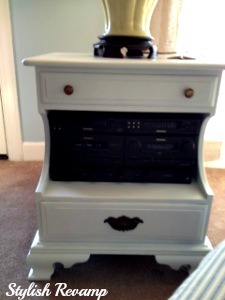 The grey pouffs and nightstand/stool I bought from Target. 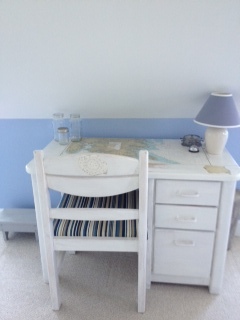 The chest at the foot of the bed was from my husband’s college days… you know how I love vintage!